Here at The Antique Fireplace Restoration Company, we offer a range of great value marble fireplace surrounds. A fireplace in itself has a charm to them that makes a home feel inviting, especially in the cold season. Having a marble fireplace surround adds to this appeal and serves other functions as well. When you have an old home with an equally aged fireplace, installing a new surround would give new life to it. 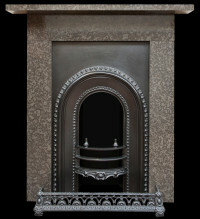 Fireplace surrounds are available in very many designs and styles that depend on the requirements you have. Marble fireplace surrounds are quite popular because of the beauty and functionality they hold all at once. At the Antique Fireplaces Restoration Company, we have a wide collection of fire surrounds to choose from, in the finest antique designs. Indoor fireplaces have their own risks, and it is imperative to minimise them, particularly with consistent use. 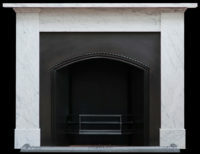 Marble fireplace surrounds offer protection through the multiple layering it offers. What happens is that a surround acts as a deterrent for sparks that escape the fireplace. Without a surround, fire sparks can enter the walls and start a fire. In fact, some residential areas include fireplace surrounds as part of the building codes for the sake of safety. The additional fireproofing insulation that a marble surround will provide for your fireplace will give you peace of mind when enjoying a warm evening in front of it. 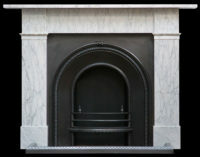 Our marble surrounds are structured to keep your fireplace as safe for use as possible. For most homeowners, a fireplace contributes to the ambience of a home. A plain fireplace can be a tad bland when compared to the rest of the home. Fireplace surrounds do a lot to spruce up such a place. Antique marble fireplaces are, especially attractive and give you so much to work with in terms of decor. A white marble fireplace, for instance, will give your living room a chic look that stands out. 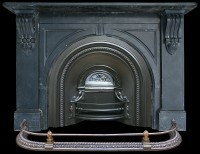 Our antique fireplace surrounds are the perfect choice for that old-school elegance. To find out more information about our range of marble fireplace surrounds, please call us on 0161 225 8967 or email any queries to info@tafrc.co.uk.